Ideal for displaying promotions or product information. Available in A4 size in portrait & landscape positions. Brochure holder is made of 3 mm policarbonate hard toscratch,not easy to break. Decorative brochures are packedunassembled with an easy mounting instruction sheet & fixing set. Decorative Brochure Stand - Landscape.. 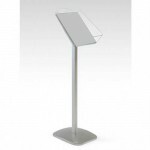 Decorative Brochure Stand - Portrait ..